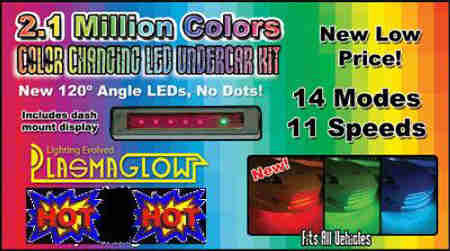 Color changing LED Under car Kit is for the serious car enthusiast. Color changing led lights for cars have become far more popular then a single color kit - Why would you want one color when you can have a kit that can change through 7 different solid colors, also allowing you to cycle and fade through all the colors, effectively creating over 2 million colors - Or you can choose to stay on one single color! You can hook up these color changing car lights to our LED Wheel Well kit, Interior LED tubes, LED Door handle lights, and even our Color Changing LED License Plate Frame! - so they too can produce over 2 Million colors. The control box is now able to be hidden under seats or under the dash and you control the kit with a small remote. The LCD remote has the color settings, the mode settings and a new speed setting so you can speed up or slow down the color changing process and the modes. You can make them strobe, chase, scan and color changing effects go faster or slower. There is also an LED strip that has 5 red LED's that blink to show what mode you are on and a color changing led to show you the color. The 2.1 Million Color changing Undercar kit includes two 50" tubes, and two 38" tubes and will have all the components as shown in the pictures below. You can mount the display panel (little square box, top left, which doubles as a LCD touch screen control) on your dash or anywhere convenient. 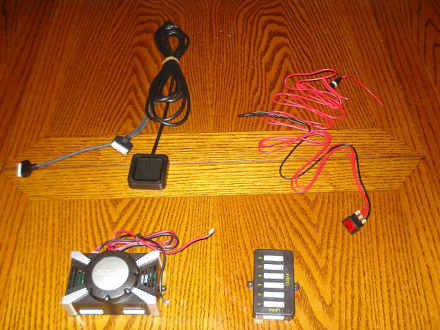 The LCD control indicates the mode that is active, so if you are on a mode that scans back and forth the led’s in the display will scan back and forth. The new kit has fewer LED’s but they are much brighter and a wider angle. This actually makes the Color changing LED Under car Kit brighter and eliminates the circle effect if the kit is mounted low. The light blends together much better on the newer tubes. We shortened the front and back tubes a little, but only because there were some problems with them fitting on some vehicles - it doesn’t effect the amount of glow though.